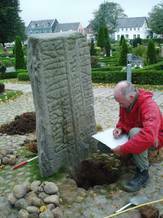 In a climate like Denmark’s it is obvious that the weather’s influence should be examined, when the condition of the rune stones is documented. The climatic factors, which can contribute to the weathering of the stone’s surface and decomposition of the rock’s structure are temperature, precipitation, wind and air humidity derived from these. The temperature that prevails on the surface of the rune stones is decided by the energy from the sun’s radiation, the surrounding air temperature, as well as the exchange of warmth between the underlying rock mass and the surroundings. In addition, the damp conditions on the surface have significance for the temperature. The level of precipitation, but certainly also condensation, play an extremely important role. 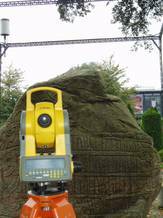 For a whole year the equipment for measuring the climate was mounted upon a temporary frame around Harald’s large rune stone. Infrared censors measured the surface temperature on the stone’s three sides, whilst humidity was measured with both a rain gauge and a humidity gauge, which registered both precipitation and condensation. In addition, the surrounding air temperature and humidity was also measured. All the data was gathered and stored in a data logger, which was emptied of data every 2-3 months. The recordings show that the temperature on the rune stone follows the course of day and night and the variation of the seasons. On sunny days the stone becomes up to 5-6C warmer than the air in the middle of the day. The stone warms up first on the text and the Christ sides, which face east and south, and then on the west-facing animal side. These results are not surprising, but of considerable significance to decomposition are the recordings of the winter’s freezing point periods. On winter days the temperature often rises above freezing point in the middle of the day, but there is frost at night. If at the same time damp is present on the stone’s surface this can cause frost damage, as water expands by 9% when it changes from a running liquid to a solid form like ice. A surprising result was that during the year-long measuring period nearly 2500 mm of precipitation fell on the stone. The normal precipitation for the area is 900 mm and the extra precipitation must be attributed to the lime tree, which directed the precipitation right down over the rune stone. As a result the tree was felled in the spring of 2009. Another surprising finding of the climatic investigation was that the stone is damp with condensation for 48% of the time outside periods of rain. The winter months are especially damp and the surface is damp for 61% of the time outside periods of rain. This is a cause for much concern, especially during periods of night frost. Apart from the investigation into the climate, the conservation investigation included: examination of the records mostly in the National Museum, an investigation of the microbiological growth on the two rune stones, a small archaeological excavation, documentation of the rune stones’ form using 3D light scanning, together with the recording of the rune stones’ geological origin and the present extent of damage. The investigation was possible thanks to a generous donation from VELUX FONDEN. Read more about the condition of the rune stones. In danish.